If I have to look at this then so do you. It's the rules. Correct me if I'm wrong, but peaches are usually considered a pretty innocuous fruit. They're often renowned for their juiciness and vague resemblance to a voluptuous backside, but you would probably never consider any thing about a peach to be extraordinary, right? Well, strike that from the record because I'm about to show you a peach that looks like a straight up innuendo. 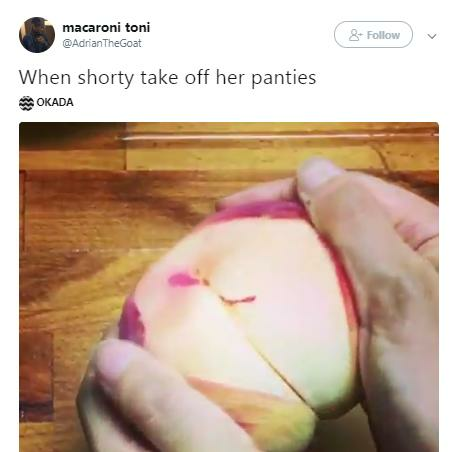 Twitter user @HOOOOJICHA posted the video of a woman's hands peeling back the skin of a peach, wantonly exposing the fruit's insides. The original post has had 52,000 retweets so far and people have a lot of questions. 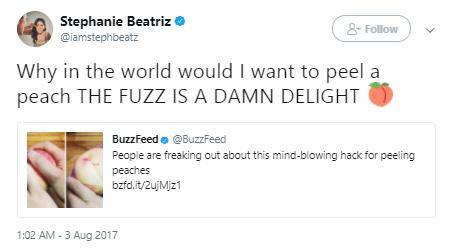 First and foremost, people want to know why you would peel a peach. But people also thought the peach reminded them of some...other scenarios. And, some people thought it was straight up disrespectful to your significant other to be looking at a peach like this. Okay, I think we all need to take a break with a wholesome book or a family friendly sitcom. We're not 100% sure what makes this peach so, um, sensual, but we can see what people are talking about. This peach has the internet all hot and bothered for the wrong reasons. I need to see my priest after looking at this.